Peʻahi (/peɪˈɑːhiː/ pay-AH-hee; Hawaiian: [peˈʔɐhi]) is a place on the north shore of the island of Maui in the U.S. state of Hawaii. It has lent its name to a big wave surfing break, also known as Jaws. The name Peʻahi originally applied to an ancient Hawaii land area (ahupuaʻa) at about 20°55′00″N 156°17′00″W﻿ / ﻿20.91667°N 156.28333°W﻿ / 20.91667; -156.28333Coordinates: 20°55′00″N 156°17′00″W﻿ / ﻿20.91667°N 156.28333°W﻿ / 20.91667; -156.28333. Like many ancient land areas, it extended from the northern slopes of Haleakalā to the sea-level Peʻahi gulch. It also lent its name to a reservoir formed by a dam across the Uaoa Stream. The name Peʻahi means "wave" in the Hawaiian language, in the sense of a fanning or beckoning motion of the hand. Much of the land is owned by Alexander & Baldwin, formerly leased for agriculture to Maui Pineapple Company (until it went out of business in 2009). The Jaws surf break is roughly three miles east of Pāʻia and just north of Pauwela from the Hana Highway (Route 36) at 20°56′36″N 156°17′52″W﻿ / ﻿20.94333°N 156.29778°W﻿ / 20.94333; -156.29778﻿ (Jaws surf break). A mostly unpaved road leads north from the highway between mile marker 13 and 14. The name Peʻahi for the break is a word-play on the nearby ancient area name, since the Hawaiians had several other words such as nalu for waves of water. When the Maui surfers John Roberson, John Lemus, and John Potterick were surfing the break in 1975, they noticed a sudden change in the conditions to huge dangerous waves, and gave it a nickname after the film Jaws, comparing the unpredictability to a shark attack. In the 1980s, a few intrepid wind surfers (Mark Pedersen, Dave Kalama, Brett Lickle) surfed the break from Hoʻokipa. The wave sizes at Jaws (which can exceed 60 feet (18 m) during the months of December to March) attract big wave surfers such as Laird Hamilton and Dave Kalama using the tow-in surfing method of big wave surf riding they co-invented (with Darrick Doerner and Buzzy Kerbox). To avoid a steep climb, rocky beach and fast-moving waves, many surfers are towed by personal water craft launched from nearby areas such as the boat ramp at Māliko Bay. In 1997 Charles and Leslie Lyon published a book of surfer photographs titled Jaws Maui. An article by Joel Achenbach on Jaws appeared in the November 1998 issue of National Geographic magazine, both photographed by Patrick McFeeley. The extreme size of the waves is caused by the structure of an underwater ridge which has been studied by scientists. Doerner, Kalama, and Hamilton appeared as stunt doubles for James Bond in the opening sequence of the film Die Another Day filmed at Jaws in 2001.National Geographic Adventure magazine had an article in its July 2002 issue. The publicity greatly increased the popularity of the site, resulting in over-crowding by 2004. The lookouts on the cliffs above the break are the best vantage points for spectators; professional photographers use boats or helicopters. The road was blocked in 2006, but cleared in 2009. There have been several "World Cup of Tow-in Surfing" contests held, but the changing conditions mean the dates cannot be set in advance. The Billabong XXL awards given to big wave surfers often have several nominated from the Jaws break in the "biggest wave" category. Even experienced surfers can be seriously injured on the violent waves, and the remote location requires expensive rescues via helicopter. On 4 January 2012, Greg Long, Ian Walsh, Kohl Christensen, Jeff Rowley, Dave Wassel, Shane Dorian, Mark Healey, Carlos Burle, Nate Fletcher, Eli Goldwyn, Goucho Gordon, Garrett McNamara, Kai Barger, North Shore locals and other of the best big wave surfers in the world invaded the Hawaiian Islands for a historic day of surfing. Big wave surfer and adventure athlete Jeff Rowley made Australian history by being the first Australian to paddle into a 50-foot plus (15 metre) wave at Jaws Peahi, Hawaii, achieving his 'Charge for Charity' mission set for 2011, to raise money for Breast Cancer Australia. On 14 March 2007 the Brazillian surfers Marcio Freire, Danilo Couto and Yuri Soledade, also known as "Mad Dogs" paddled surfing on a big day at Jaws, showing that it was possible. On 30–31 January 2012, Rowley and a number of international big wave surfers including Greg Long, Shaun Walsh and Albee Layer spent two days paddle-surfing Jaws, on the Hawaiian island of Maui, as part of their ongoing big-wave paddle-in program at the deep-water reef, further cementing the new frontier of paddle-in surfing at Jaws. On 30 March 2012, Rowley was a finalist in the Billabong XXL Big Wave Awards 2011/2012, in the Ride of the Year category with his rides at Jaws Peahi in Maui, Hawaii on 30 January 2012, placing him 4th place in the world of elite big wave surfers and meriting the respect of the big wave surfing community. A big wave surfing contest hosted by Red Bull was held at Jaws Peahi, with invitation of 21 of the best big wave surfers in the world. The waiting period for the contest was from 8 December to 15 March 2013. Some of the known invitees to the contest included Jeff Rowley, Albee Layer, Greg Long, Shane Dorian, John John Florence, and Kala Alexander. ^ Lloyd J. Soehren (2010). "lookup of Peʻahi ". in Hawaiian Place Names. Ulukau, the Hawaiian Electronic Library. Retrieved November 29, 2010. ^ Lloyd J. Soehren (2010). "lookup of Peʻahi Reservoir". in Hawaiian Place Names. Ulukau, the Hawaiian Electronic Library. Retrieved November 29, 2010. ^ Mary Kawena Pukui and Samuel Hoyt Elbert (2003). "lookup of Peʻahi". in Hawaiian Dictionary. Ulukau, the Hawaiian Electronic Library, University of Hawaii Press. Retrieved November 29, 2010. ^ a b Timothy Hurley (November 18, 2002). "Maui's monster surf break getting bigger by the day". Honolulu Advertiser. Retrieved November 29, 2010. ^ John R. K. Clark (2004). "lookup of Peʻahi ". in Hawai'i Place Names: Shores, Beaches, and Surf Sites. Ulukau, the Hawaiian Electronic Library, University of Hawaii Press. Retrieved November 29, 2010. ^ Mary Kawena Pukui and Samuel Hoyt Elbert (2003). "lookup of wave". in Hawaiian Dictionary. Ulukau, the Hawaiian Electronic Library, University of Hawaii Press. Retrieved November 29, 2010. ^ a b John R. K. Clark (2004). "lookup of Jaws ". in Hawai'i Place Names: Shores, Beaches, and Surf Sites. Ulukau, the Hawaiian Electronic Library, University of Hawaii Press. Retrieved November 29, 2010. ^ Catherine Lo (January 2010). "Big Waves, Epic Tales". Maui No Ka 'Oi Magazine. 14 (1). Photography by Patrick McFeeley. Archived from the original on August 26, 2010. Retrieved November 29, 2010. ^ Charles Lyon; Leslie Lyon (1997). Jaws Maui. ISBN 978-0-9658986-0-7. ^ Joel Achenbach (November 1998). photography by Patrick McFeeley. "Maui Surf". National Geographic. Retrieved November 29, 2010. ^ Brian Perry (June 28, 2009). "Snapping Jaws: Photographer gets in deep with one of the world's most dangerous waves". Maui News. Retrieved November 29, 2010. ^ Katie M. Fearing and Robert A. Dalrymple. "Wave Refraction at Jaws, Maui". Center for Applied Coastal Research web site. University of Delaware. Retrieved November 29, 2010. ^ Nicole Davis (July 2002). interview of Dave Kalama, about article "The Joy of Fear". "Surfing Into Jaws". National Geographic Adventure. Retrieved November 29, 2010. ^ Ilima Loomis (December 18, 2004). "Crowd control needed at Peahi cliffs". Maui News. Archived from the original on March 5, 2005. Retrieved November 29, 2010. ^ "Jaws". Maui Guidebook blog. December 7, 2009. Retrieved November 29, 2010. ^ "Tow Surfing World Cup Jaws". Hawaii Xtreme Sports TV web site. October 7, 2007. Retrieved November 29, 2010. 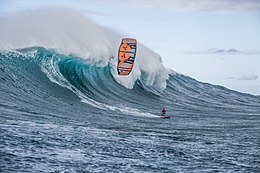 ^ "2004 Tow-In World Cup confirmed for Peahi Maui Hawaii". Tow Surfer web site. January 13, 2004. Retrieved November 29, 2010. ^ "XXL Biggest Wave". Billabong Pro web site. 2010. Retrieved November 29, 2010. ^ Melissa Tanji (January 13, 2010). "Braving 'Big Kahuna' comes with big risks". Maui News. Retrieved November 29, 2010. Wikimedia Commons has media related to Surfing at Peahi. Ron Dahlquist (May 31, 2010). "Garrett McNamara in a huge barrel at Peahi or "Jaws," north". photo. National Geographic. Retrieved November 29, 2010. "Kalani Prince" (December 7, 2009). "Canon 5D Mark II Slow Motion + Jaws ( Peahi ) 12-7-09". video of Laird Hamilton, Kai Lenny and Jason Polakow. Vimeo. Retrieved November 29, 2010. Oxbow surfwear (December 7, 2009). "Oxbow Rider Laird Hamilton at Jaws – December 7th, 2009". video. YouTube. Retrieved November 29, 2010. PureDigital Maui (July 16, 2006). "Maui Jaws: Big Wave Surfing". video. YouTube. Retrieved November 29, 2010.